(CNN) – Texas Gov. Rick Perry is hitting the road to drum up business. But he isn't on a tour of the Lone Star State. Instead, Perry set off for California on Sunday, where he will spend four days trying to convince business leaders to move their operations from southern and central California to Texas. He began his pitch earlier this month with a radio ad which has run on Golden State airwaves from Los Angeles to Sacramento. "Building a business is tough, but I hear building a business in California is next to impossible," he says in the ad. "This is Texas Gov. Rick Perry, and I have a message for California businesses: Come check out Texas." Perry touts Texas’ tax policy, limited regulations on business and a legal system that includes tort restrictions. A website for the effort notes his state's recovery from the recession, job growth, low unemployment rate and low price for natural gas. This morning on "Starting Point," San Diego Mayor Bob Filner weighs in on Perry's plan to lure companies from California to Texas. The jobs recovery continued to crawl forward at a slow pace in January, and there's little hope it will pick up any time soon. The U.S. economy added 157,000 jobs in January, according to a Labor Department report released Friday. That's slower growth than in December, when employers hired 196,000 workers. This morning on "Starting Point," Christine Romans breaks down the numbers and explains why she thinks they show modest growth. 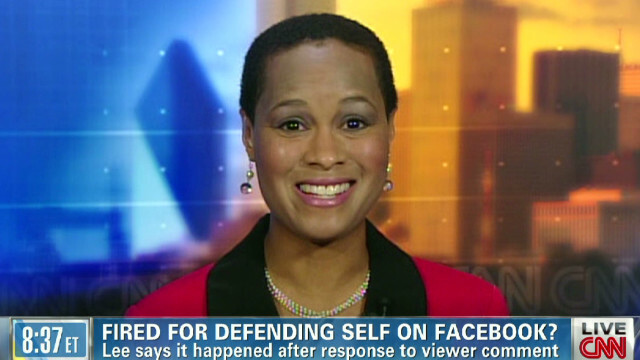 Could you lose your job for defending yourself on Facebook? Rhonda Lee says she was fired from her job as meteorologist for KTBS in Shreveport, Louisiana because she responded to a racial remark posted by a viewer on the station's Facebook page. Lee, who keeps her hair short and natural, received a comment on the page from a viewer who didn’t like her hairstyle. Lee’s response was followed by her termination. Lee joins “Starting Point” live from Dallas to talk more about it. According to KTBS, Lee violated the social media procedure of the station by responding to the viewer's comment. Lee says she was not even aware of the policy at the time. She simply thought she needed to respond to the remark that was addressed to her in particular. "Racial comments can be very sensitive," she says, but she didn't consider her topic controvercial at all. Soledad O'Brien relates Lee's experience to that of Wisconsin reporter Jennifer Livingston, who was criticized about her weight by a viewer earlier this year. She responded to it on air and her station rallied around her while others cheered her on. O'Brien asks whether Lee could have used this opportunity to launch a similar conversation. Lee says Livingston's experience came to mind, but her "first response was education." "I feel like I was being punished for defending myself," Lee says. "Whereas other people are given platforms, I was given a pink slip instead." Americans for Tax Reform's Grover Norquist weighs in on the October jobs report and what it means for the election. Ken Rogoff, Professor of Economics & Public Policy at Harvard University, weighs in on the October jobs report. Fmr. FDIC chair Sheila Bair says Mitt Romney & President Obama have not shared enough details on their economic plans. VIDEO: CNN's Crowley: Many undecided voters may be 'disgusteds' who may not show up to vote. CNN's Candy Crowley argues undecided voters may be turning into 'disgusteds' as the presidential race comes to an end. CNN's Ali Velshi explains how the October jobs report signals the state of the US economy. Prior to the October jobs report release, Obama Campaign's Robert Gibbs talks w/ Soledad on "Starting Point" about how the jobs report could affect their message to potential voters.